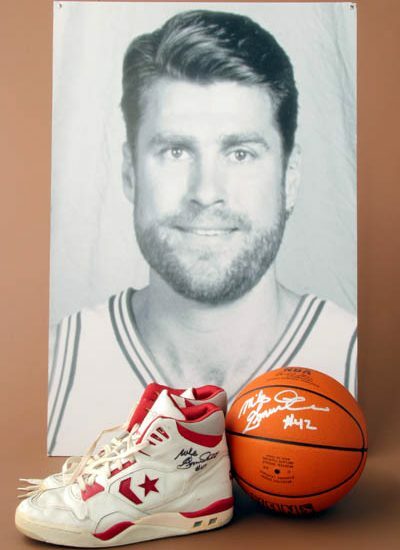 A 6’11″ center, Gminski played 14 seasons in the NBA. He had an outstanding collegiate career at Duke where he was named ACC Player of the Year for the 1979-80 season. A two-time All-American, Gminski is Duke’s all-time leading rebounder and shot blocker. He was selected by the New Jersey Nets as the seventh overall pick in the 1980 NBA draft. During his seven seasons with the Nets, Gminski established himself as a tough player and helped lead the franchise to the playoffs five times. In his final season with the Nets he averaged 16.4 points and 8.8 rebounds before being traded to the Philadelphia 76ers. In his first season with Philadelphia, he averaged 16.9 points and 10 rebounds per game. The following year he averaged over 17 points per game and led the 76ers to the Atlantic Division title. During his NBA career, Gminski scored more than 10,000 points and grabbed over 6,000 rebounds, a feat accomplished by only a handful of players in NBA history. More than twenty years after leaving Duke University, Mike Gminski’s name remains prominent in the illustrious basketball program’s record books. The former two-time All-American remains the Blue Devil’s all-time leading rebounder and shot blocker, and third-leading scorer. But when his collegiate playing days ended, the 6-11 center also enjoyed an outstanding 14-year NBA career, and is one of only a handful of pro players to score more than 10,000 points and haul in more than 6,000 rebounds. The great-grandson of a Polish immigrant from Karkow, Mike Gminski was born on August 3, 1959, in Bridgeport, Connecticut. He grew up in nearby Monroe, where he attended Masur High School. Encouraged by his parents, Mike played tennis, baseball and football, and developed into one of the state’s best high school basketball players. He was also a very good student — so good that he was able to leave high school a year early, a fact that most college recruiters overlooked. Mike struck up a friendship with a Duke player named Terry Chili at a basketball camp, and decided to make the Durham, North Carolina school his first visit after his sophomore year. He “fell in love with the campus” and committed to the Blue Devils. At Duke, head coach Bill Foster was trying to rebuild the program that had not been to the NCAA tournament in more than a decade. It became apparent very early that his freshman center could help him do just that. In his first season Gminski averaged 15.3 points and 10.7 rebounds for the 14-13 Blue Devils, and was named Atlantic Coast Conference 1976-77 co-rookie of the year. As a sophomore Mike averaged 20 points and 10 rebounds, earning first-team All-ACC honors. Even better, the Blue Devils posted its first of three straight 20-plus win seasons. Duke also won the ACC tournament for the first time since 1966, and made the NCAA tournament field. Mike had an excellent tournament, including a 29-point performance against Notre Dame in the semi-finals. The Cinderella Blue Devils made it all the way to the 1978 national championship game, where they battled valiantly but lost to Kentucky, 94-88. Mike had 20 points and 12 rebounds in the game, and was named to the All-NCAA Final Four team. As a junior Mike had an incredible season, leading Duke in scoring (18.8), rebounding (9.2), blocked shots (66), dunks (44), and field goal shooting (51.9%). He earned All-American honors and was named ACC Player of the Year. Duke complied a 22-8 mark and qualified for the NCAA tournament, but lost in the first round to St. John’s. In the 1979-80 season the talented center was again a first team All-American, posting career highs in scoring (21.3), and rebounding (10.9). Mike also set a school single-season record for blocks with 97. His senior season also marked the third time that the history major was named an Academic All-American. That season Duke struggled down the stretch amid rumors that head Coach Foster would leave following the season. The Devils were seeded sixth for the ACC tournament and had little hope of landing an NCAA bid unless they won it. Duke responded by beating the top three seeds and winning the ACC crown. Duke advanced to the regional quarterfinal of the NCAA tournament before losing to Purdue. Gminski ended his collegiate career with numerous school records, and still holds Duke’s career records for rebounds (1,242) and blocked shots (345), and is third in scoring (2,323 points). His jersey, number 43, was retired by Duke shortly after he left the school, and he was later inducted into the Duke Sports Hall of Fame. “G-man” was then selected in the NBA drafts first round (7th overall) by the New Jersey Nets. Gminski helped revive the struggling Nets, who made the playoffs in five of his seven seasons. He displayed a consistently outstanding all-around game, and was particularly known for his shooting touch. In fact, in four of his NBA seasons he hit better than 50 percent of his shots from the field. Gminski came into the league at about 240 pounds, but bulked up to as much as 270 pounds. Following his rookie season in New Jersey, Mike contracted a serious infection in his back after having surgery on an injured elbow. He was in critical condition for three days with a 105-degree temperature before doctors were finally able to successfully control the infection. His weight fell from 265 pounds to 215 pounds during his hospital stay. Mike was traded by the Nets in 1987, after enjoying one of his best seasons (16.4 points per game, 8.8 rebounds per game). He was among New Jersey’s all-time leaders in several categories. He was second in games played (550), third in minutes (13,638), rebounds (3,671) and blocks (599), and fourth in points (6,415). Gminski went to Philadelphia, where he continued to excel. In his first season (1987-88) with the 76ers he averaged a “double-double”, with 16.9 points and 10 rebounds (along with 118 blocked shots). The following season Mike enjoyed his highest scoring average (17.2) as a pro as the 76ers won the Atlantic Division with a 53-29 record, but lost in the playoffs to Chicago. Those 76ers teams were among the best that Mike played on in the NBA, but he enjoyed the camaraderie as much as the winning. “The closeness of the players reminded me of my teams at Duke,” he recalled. In 1990 Mike was dealt to the Charlotte Hornets, an expansion franchise in its third year in the NBA. He has had a good first season upon his return to the state of North Carolina, but suffered a herniated disk. Injuries began to take their toll, and in 1994 he was traded to Milwaukee for Frank Brickowski in what was basically a salary move. Not wanting to become a “basketball vagabond” jumping from team to team, Gminski accepted an offer from the Charlotte Hornets to join their broadcast team. He stayed there for eight years, until the franchise moved to New Orleans, and then Mike joined the Fox Sports Net telecast team as a lead analyst. He lives in North Carolina with his wife, Stacey Anderson, and their son, Noah. Gminski continues to receive recognition for his athletic achievements. Last year he was named to the ACC 50th anniversary team. He also was named to the North Carolina Sports Hall of Fame. He was also chosen as one of a group of 25 finalists for induction into the Verizon Academic All-American Hall of Fame. 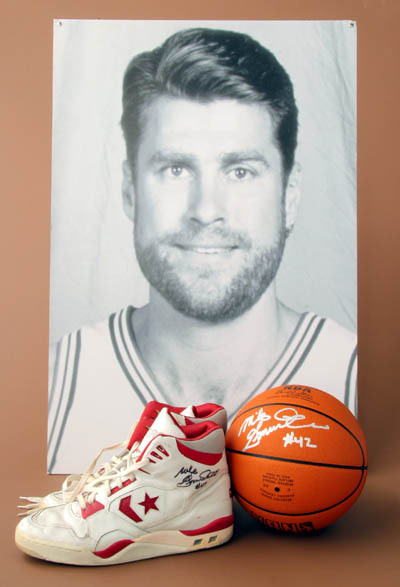 While Mike Gminski is widely considered one of college basketball’s greatest players, he certainly does not receive his due as a professional athlete. He was not a flashy player who drew headlines on or off the court, but Gminski’s career totals are quite impressive. They include 10,953 points, 6,480 rebounds and 989 blocked shots. He was skilled in all facets of the game, and was a well-linked and respected teammate wherever he played.